The NC Department of Environmental Quality is accepting public comment until Aug. 19 at 5 p.m. on the Atlantic Coast Pipeline’s application for a water quality certification and buffer authorization. This is known as a 401 certification. O n three of the four corners of Whistling Rufus and Philadelphus roads on the outskirts of Pembroke sit a smattering of homes of varying ages and conditions. On the northwest corner, a stark, modest two-story with a child’s slide in the back yard; to the northeast, a one-story ranch where the crape myrtles are blooming in brilliant hues of magenta and pink; and to the southwest, a mishmash of buildings, including a mobile home with foil covering its front windows to block out the morning sun. 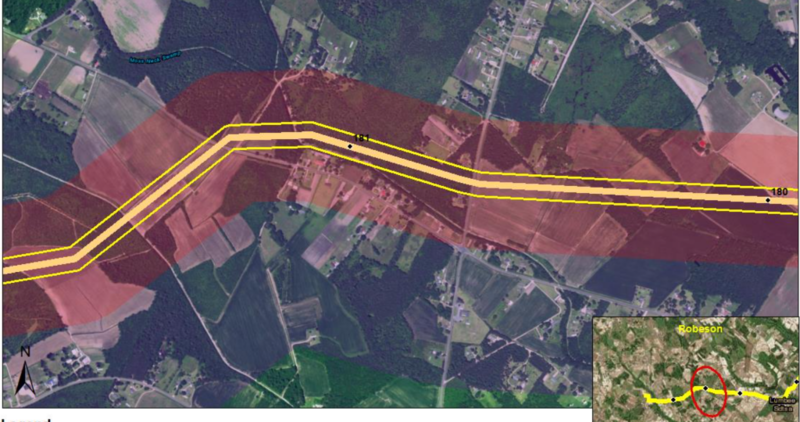 All of these houses share at least one commonality: They lie within the blast zone of the Atlantic Coast Pipeline, where people would likely be injured or die in the event of a natural gas explosion. Clean Water for North Carolina issued a report this week with maps showing the most vulnerable areas in seven of the eight counties along the 160-mile portion of the route in eastern North Carolina. 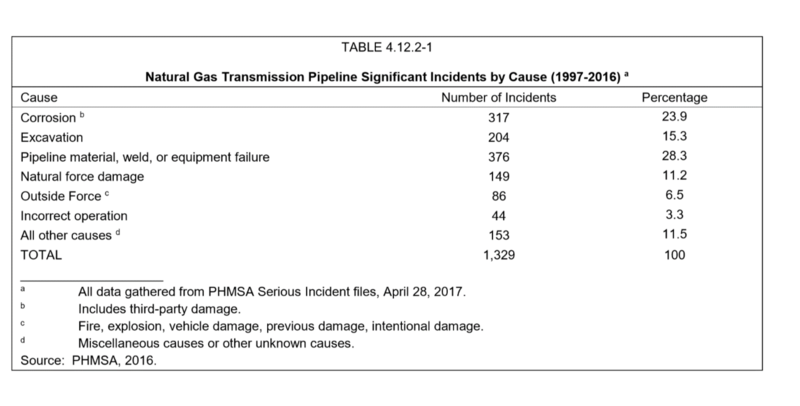 Meanwhile, BREDL (Blue Ridge Environmental Defense League) sent a letter to the state fire association detailing the causes of the 1,329 pipeline accidents over the past 20 years — including corrosion and welding failures — and the resulting risk to both rural North Carolina and first responders. The Final Environmental Impact Statement for the ACP identified 24 High Consequence Areas in North Carolina. Of the eight counties along the route, all but Sampson have at least one of these areas: they have at least 20 occupied buildings or “vulnerable populations” — daycare centers, retirement homes. In addition to these High Consequence Areas, ACP contractors, hired by Duke Energy and Dominion Energy, calculated a Blast Zone of 660 feet, based on the pipeline’s 36-inch diameter and the pressure per square inch. But Oshin Paranjape, who is pursuing her master’s degree at the Duke University Nicholas School of the Environment, reviewed the contractors’ technical documents on behalf of Clean Water for North Carolina. Based on that data, Paranjape calculated the Blast Zone is 943 feet — about a third larger than ACP contractors figured. The evacuation zone is 3,071 feet, more than a half-mile from the radius. That means at the corner of Whistling Rufus and Philadelphus roads, the home with the child’s slide and the ranch with the crape myrtles are within the blast zone, as are many houses to the north. The mobile home with the foil covering the windows, the Green Pine Free Will Baptist Church and buildings to the south lie within the evacuation zone, assuming the wind is blowing away from it. C lean Water for North Carolina’s and BREDL’s reports coincided with the state’s final public listening sessions about the effects of the pipeline on water, wildlife habits and forests; plus environmental justice and economic issues of the $5.5 billion project. 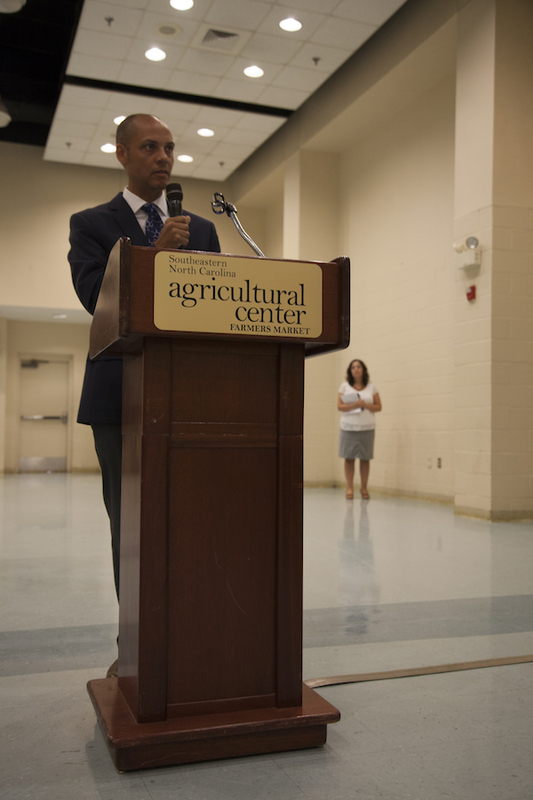 After DEQ held public hearings on the water quality issues, Secretary Michael Regan added three more listening sessions in Nash, Northampton and Robeson counties, and invited additional state agency representatives from Indian Affairs, Commerce and Natural and Cultural Resources, to attend. Chief Deputy Secretary John Nicholson said the sessions were added because other concerns regarding economic benefits, environmental justice and tribal lands had emerged during the initial hearings. Lumberton held the last of the three sessions. 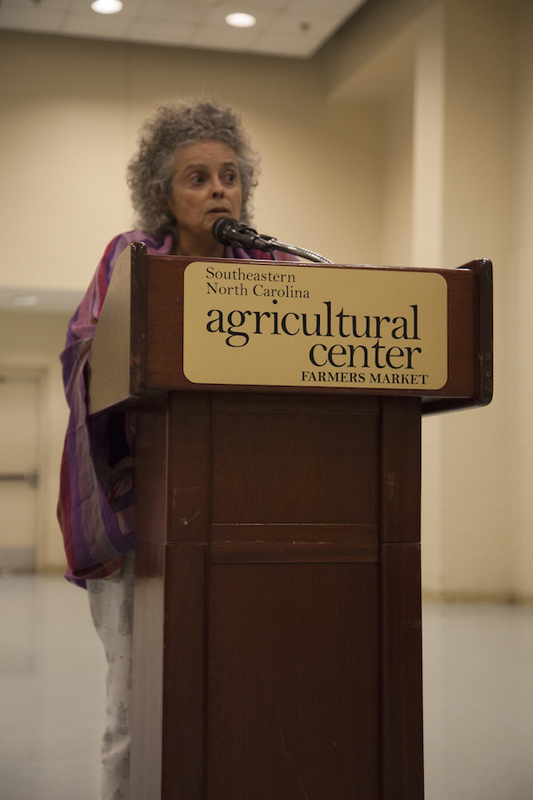 Here, state officials heard from members of the Lumbee tribe, as wells as environmental advocates from Sustainable Sandhills and private citizens — all of whom opposed the ACP — and who recommended that the state prioritize renewable energy instead. Opponents question whether the ACP is even necessary, considering there is already a pipeline serving eastern North Carolina: the Transcontinental, which runs west to east and cuts through Hamlet in Richmond County. The ACP would also cut through Hamlet. And the ACP would largely serve Duke and Dominion’s own electricity-generating plants; only a small portion of the gas, federal documents say, would directly service neighborhoods or industry. Chambers of Commerce and elected officials along the route support the pipeline because, they say, the additional natural gas would help attract industry to economically stressed eastern North Carolina. However, there are no firm estimates on how many companies would locate in this part of the state for that reason. And ratepayers would bear the cost of the pipeline construction. Tom Clark, hoisting a 36-inch diameter hoop to illustrate the size of the pipeline, challenged the purported economic benefits. He questioned whether the environmental and public health risks were worth 20 permanent positions and 400 temporary construction jobs that would likely go to locals in eight counties, according to ACP documents. The other 400 would go to out-of-state workers. Do you really think this pipeline isn’t going through? Do you not realize how close Duke is with Cooper? Remember when Cooper made loud noises about getting shareholders to pay for coal ash – now that the rate hikes are coming in, have you seen Cooper anywhere? The same is true here. Back when Cooper was going after TVA (very ineffectively as it turned out) that was purely to keep Duke’s rates competitive by forcing TVA to increase their costs. Duke wants this pipeline – Duke gets this pipeline.